When the weather is hot, the demand for electric power and the market value of electric energy are high. 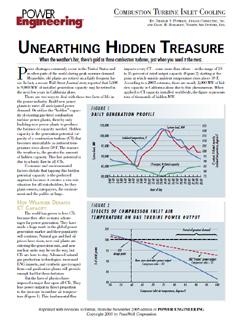 Unfortunately, just when you need it the most, generation capacity of all combustion turbines (CTs) decreases during the hot weather and power producers lose the opportunity to maximize their profit potential. Turbine inlet cooling (TIC) maximizes the potential of your generation assets by increasing capacity during hot weather. TIC is commercially proven and hundreds of CT systems are already deploying it. TIC provides incremental capacity at economically attractive low costs. 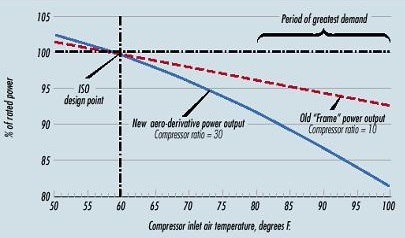 Hot weather also decreases the energy efficiency of CTs. TIC also helps recover some of the efficincy loss. TIC on combeined-cycel systems prevents or reduces the need to operating simple-cycle peaking systems that have higher heat rates and thus, reduce grid-wise emissions. Similarly, TIC on simnple-cycle systems pevents or reduces the need to operate even higher heat rate boiler-based steam turbines. 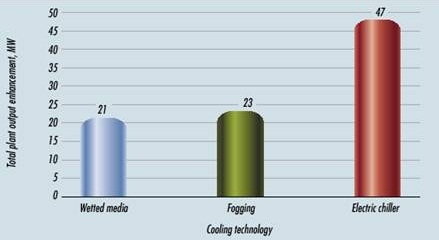 There are several TIC technologies commercially available: wetted media, fogging, indirect evaporative, mechanical chillers (chilled water or ammonia), absorption chillers (lithium bromide in water or aqua ammonia) with or without thermal energy storage (TES), hybrid systems and wet compression. Which of these technologies is optimum for your application? It depends on several factors including: typical weather conditions at your plant location, real-time market value of electric energy, market demand for capacity, gas cost, and CT characteristics and operating configuration. We perform a variety of technical and economic feasibility studies, ranging from preliminary to detailed evaluation, and system optimization studies. The detailed studies are performed using the 8,760 hours of hourly weather data for the specific plant location. We provide consulting services for power plant owners, energy service companies, and design and engineering contractors. The scope of our services includes technical and economic analyses of alternative technologies, system optimization, developing bid specifications, evaluating bids, technical support through detailed design, construction and commissioning, performance test evaluation. 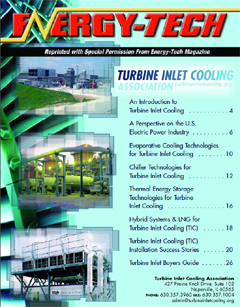 A complete list of our turbine inlet cooling publications and presentations is available. A copy of our brief brochure for TIC is available.